I have met very few people who have been totally happy with their lawn that is growing in shade, especially in a lot of shade. Most grass species want as much sun as they can get. Grass seed sold for “shady” areas really needs a minimum of 4 hours of sun a day to grow without stress. If you have an area that gets less than four hours of sun, you have to make adjustments to your lawn care program. 1. If it is possible, you can improve the health of the shaded grass by raising the canopy of your trees so branches start no lower than 8 feet; higher is better. You want to allow as much light into the area as you can. 2. Just in the last few years, seed companies have come out with a seed mixture that is labeled for “dense shade”. This mix will probably work fairly well if you get two to fours of sun. Anything less that two hours means even this product may not do very well. 3. Shaded turf gets thin from the heat of the summer. You need to overseed your shaded area every year in the fall; around Labor Day weekend. 4. Mow the shaded grass an inch higher than you mow your sunny lawn. The more leaf surface left on the grass, the better chance it has to stay happy. 5. Shaded grass needs water before the grass in the sun. Water deeply every few days to a week rather than a little bit each day. 6. Hold back on the fertilizer. Shaded turf needs less fertilizer, so I suggest you fertilize only in fall with a slow release type of nitrogen fertilizer sometime in late October. This builds the root system without putting too much energy into growing foliage. Since grass growing in the shade is quite tender, you should try to have the kids avoid walking over the lawn in the shady part as much as possible. Of course, my strong recommendation is to avoid trying to grow grass in the shade. Not only is it difficult, grass competes with the trees for food and water and the grass wins. You not only have grass in stress, but because of the grass your trees are in stress. 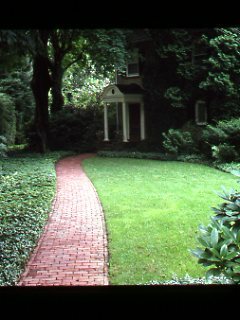 I suggest considering a groundcover of some kind to replace as much of the shaded grass as you can aesthetically tolerate. Even a few feet of ground cover around the base of the tree protects it from damage from the lawn mower or string trimmer. A shady lawn is a high maintenance lawn.